37 weeks, 5 days pregnant today...but who's counting?! 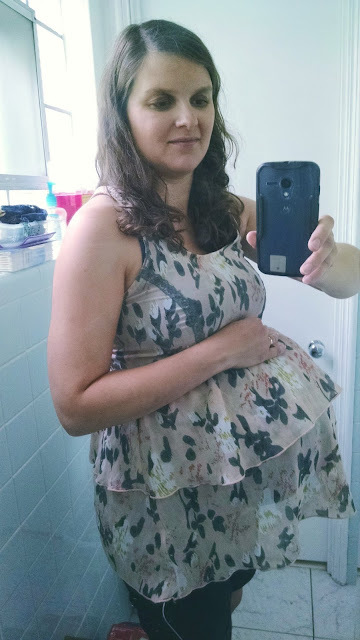 As the long stretches of silence on this blog attest to, this pregnancy has stretched me in ways I didn't think possible. In trying to process it all, I alternate between being traumatized by various aspects to feeling strong and grateful for being able to do things I haven't previously been able to do. My Zofran pump is the perfect example of this. I think back to all the times I've stuck myself with a needle, to the pain that caused, and also to the pain, welts, bruises, and burning sensation it's caused...and I just want to curl up in a ball and cry. But then, I think about the difference the pump has made, how sick I would be without it, and how amazing it is that the love I have for a little girl I have yet to meet, motivates me to stick a needle in my skin (sometimes multiple times a day). Then, I am flooded with gratitude and in awe of the graces I've received this pregnancy. Because, that's basically what this pregnancy has been for me. I've walked a tightrope between being gripped by sadness and fear and being overwhelmed by hope and love. There isn't much space in between. In these final days (or weeks) of pregnancy, I feel this even more acutely. The end of pregnancy is hard for every mom. But in addition to those normal struggles is weird HG stuff. There's the ongoing nausea and feeling like puking. But, it's HG, so it's also being worn down by all the HG triggers. It's missing being able to read a book without the smell and feel of the paper making you too nauseous to continue. It's constantly shushing or shooing your children because their little voices and hugs make you feel like throwing up. It's getting sick from a light being on, or from looking at a screen. And it's also the well meaning comments... especially people reassuring you that it's ok if it's still weeks until you deliver your baby, when you're hoping it will be hours. It's being asked your due date a million times, and being reminded that there are still days and days between you and an end to perpetual stomach flu. To add to all of that, I've been feeling so afraid of labor lately. Afraid of the pain, and afraid of the unknown. 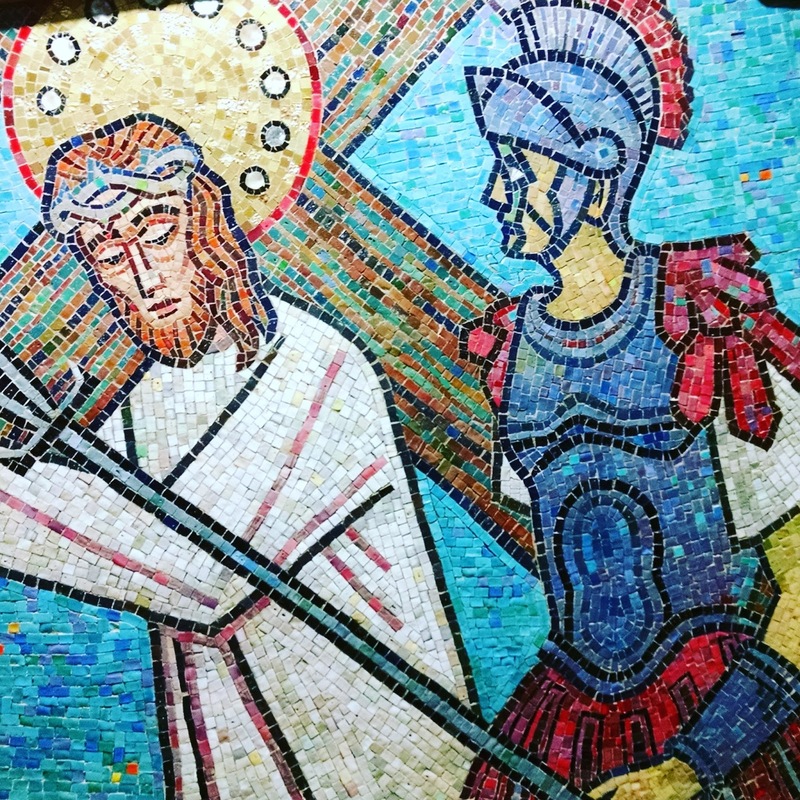 I had my weekly doctor appointment, and although I had looked up Mass times in the hospital chapel and knew Mass was earlier, I decided to pay Jesus a quick visit, anyway. Except that, as I knelt in the chapel, more and more people trickled in, grabbing a Missal as they entered. Then a priest came. Then...there was Mass! After Communion, I was praying... praying for my four children and husband, and begging God for the grace to keep going. And then, it washed over me- beautiful peace and sudden conviction that I needn't be afraid. I felt renewed grace to offer up my suffering, and suddenly didn't feel terrified of labor anymore. It was just a moment of grace, pure and simple. But that moment changed everything. I may still have days or weeks of HG left. I may have a painful labor ahead. I may even have another bout of post-partum depression ahead. But it is just the cross. And Christ has already conquered the cross. There is no need to be afraid. Good reminder! I'm starting to get nervous about labor as well. My last two were c-sections, so it's been a while since I delivered naturally. Am I still up to it?? But God will be there with me, as you say. Jesus, I trust in You! Hang in there! Can't wait to see your little one.